Traditional Chinese medicine has an important role to play in improving the treatment of people with HIV infection, according to one of the leading experts in the field. To use traditional Chinese medicine (TCM), you don�t have to understand its underlying philosophy or principles. You can take the herbs, receive acupuncture, and try other therapies much as you would take a pill � Western style � and you will still reap considerable benefits. You become more tuned into your physical and spiritual self. You become aware of the profound impact of your breath on your physical and mental well-being. You begin to sense the flow of Qi �the life force�through your body. You tune into your own mental and physical strengths and imbalances. You learn to rejoice in the interconnectedness of all life experience. This transformation creates a sense of empowerment that�s particularly important in dealing with a chronic disorder such as HIV disease. A condition like this can erode your sense of control over your own body and make you feel estranged from your physical and spiritual self. But there is a way to get reconnected to the total �you.� Putting yourself within the Eastern frame of mind can help you get the most out of Western treatments, while reducing their negative side effects. You�ll also be better able to manage HIV-associated disorders and diseases, such as sinusitis and chronic diarrhea, which often resist Western treatments. So I hope you�ll take the time to explore a little bit about the inner workings of Chinese medicine. It can bring a great deal of joy and healing into your life. In my practice, I have observed and treated thousands of people with HIV and AIDS. In particular, I�ve done clinical evaluations of the tongues of more than 600 people with HIV infection or AIDS and used the techniques of pulse diagnosis. Through this process, I have come to understand that HIV infection is triggered by toxic heat, and initially attacks the spleen and stomach organ systems. They are the central organs involved in this complex syndrome and must be supported throughout the entire course of the disease�s treatment, even when the HIV-related disharmonies expand to involve all the other organ systems as well. Toxic heat creates the initial flu-like symptoms that for many people come with initial exposure to HIV. And as the toxic heat moves more deeply into all systems of the body, it triggers a whole variety of common HIV-related symptoms: pruritis (chronic itching), sore throat, increase in body temperature, a sense of having a fever even if one is not present, and a nagging sensation that something toxic is present in the body. Toxic heat is also responsible for the cascade of organ system disharmonies in the spleen, stomach, kidney and liver, which contribute to the major complication associated with HIV infection: wasting. The spleen and stomach systems govern the digestive process, transforming food energy and fluid into Qi and Xue (blood). As a result, the spleen and stomach moisten and nurture all the other organ systems and channels. In addition, symptoms of early-stage HIV infection (such as dry skin and lips) set in when the flow of fluids and food essence from the spleen and stomach to the lungs is disrupted. Often dryness in one area triggers dampness in another. Thus, spleen Qi deficiency with dampness can manifest in one or more of such symptoms as early neuropathy (a numbness or tingling sensation that often occurs in the hands or feet), swelling and inflammation of the lymph nodes, vaginal yeast infections, more serious loose stools, or bloating. Spleen-related diarrhea is very common, with loose stools and abdominal bloating after eating. Skin rashes, commonly associated with early-stage HIV infection, are a result of spleen Qi deficiency and lung disharmonies interacting with the essential substances. Spleen Qi deficiency also causes deficient Xue (blood). Once this sets in, the door is opened to allow Toxic Heat to enter the depleted blood and penetrate ever deeper into the body. The body then moves into more advanced stages of HIV/AIDS. If unchecked, an increasing depletion of the fluids of the Spleen (the Spleen�s Yin aspect) leads to overall Yin deficiency, which in turn can lead to Yang depletion. The combination of Western and Chinese therapies can temporarily slow the progression of HIV infection to end-stage AIDS for many people. But wasting can become severe when the cascade of spleen- and stomach-triggered disorders causes overall Yin deficiency and Yang depletion. Diarrhea stops, and the skin becomes drier and drier. Thirst is unquenchable. Fevers spike every afternoon and often in the evenings. The pulse is rapid, �thready,� and superficial. This is a terminal stage of HIV disease. Acupuncture and herbs are used to support the Shen (spirit) and the passing over to a new phase of existence. Looking at HIV disease from the perspective of TCM, the disease starts as an assault by toxic heat that starts with damage to the spleen and stomach, then moves on to include other organ systems and essential substances. This approach provides a concise method of describing, diagnosing, and treating the whole constellation of HIV-related diseases � and those who live with them. Dr. Misha Ruth Cohen, OMD, L.Ac., has over 25 years experience in the practice of Asian medicine � including acupuncture, herbal medicine, nutrition and diet, and Asian bodywork. 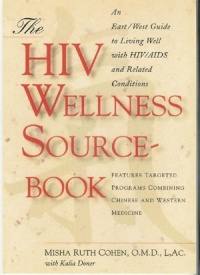 Misha is the author of three books: The Chinese Way to Healing: Many Paths to Wholeness; The HIV Wellness Sourcebook: and The Hepatitis C Helpbook. She is internationally known as a practitioner, teacher, and mentor to Chinese medicine practitioners around the world. Today, Cohen has developed great expertise in the area of gynecology and is considered one of the pioneers of using traditional Chinese medicine to help treat HIV and AIDS. Visit her website at http://docmisha.com.